When it comes to paying bills, I’m horrible! My wife is the queen of paying our bills on time and refuses to let a bill go unpaid or pay a silly late fee. 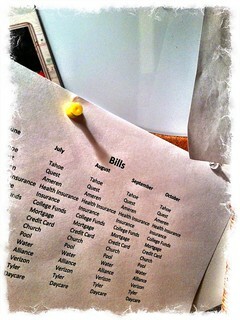 To my amazement, she doesn’t need an app on her iPhone to reminder her when a bill needs to be paid like I would. She just uses a simple single sheet of paper pinned up next to our home computer (see pic to the right). She definitely completes me. For those that need more than a single sheet a paper, I’ve asked Miranda to share some neat ways to setup a bill reminders so that you never pay another late bill again. Whether you pay your bills using the old checkbook method, or whether you get online and make your payments, sometimes it’s easy to forget when it’s time to send your money. Once you forget, problems can follow. Many companies, from credit card issuers to utilities, will charge you a late fee if your payment doesn’t arrive on time. Habitually making late payments can add up to thousands in wasted money over your lifetime. If you want to make sure you are up to date on all of your accounts, and that you don’t forget to send payment, you can set up bill reminders to help you along. Google calendar: This is an almost universal way to remind you that a bill is due. You can go into your Google Calendar and arrange to have a reminder pop up, or be emailed to you, on the day you want to pay your bill. Enter the details, including the name of the payment, and who you are making the payment to, into the cell. Schedule it for “all day,” and you’re set. You’ll get the reminder as you’re checking your email — or even on your phone if your phone is set to alert you in these cases. Mint: You can receive bill reminders right to your phone or email if you use Mint.com. This is the premier online personal finance budget tool, and it’s possible for you to schedule bill pay reminders. Just go into Mint and “Add a reminder.” Mint also suggests that you set up reminders based on your transactions, so you can set reminders to recur every month. Manilla: One of the latest financial management tools to hit the web is Manilla, and this application also features bill reminders. You can have reminders pop up on your phone if you are using the mobile app, or you can receive them via text message or email. Reminders are customizable so that it’s easy to view them the way you want. What Bills? : This web-based bill reminder service sends email notifications to help you keep up with when things are due. You can also keep up with what you have already paid with What Bills?, so that you have access to completed transactions. Plenty of other services offer bill reminders. You can get them in Quicken, YNAB, and other major financial software applications. However, some of the notifications only pop up when you open the application, so double check to make sure you receive email, text, or mobile app notifications. Of course, you can reduce your need for bill reminders by automating some of your bill payment. Some bills, especially recurring bills, can easily be managed by simply having an automatic debit set up so that the money is taken from your account each month. You don’t have to worry about forgetting when the bill pay pays itself. How to do you keep track to pay your bills? Have you setup a unique reminder system? I would like to start a business with this concept. I would like to charge a monthly fee or even a yearly fee for more savings. I would like for my customers to put there bill date in themselves if possible so they can get reminded every month with a email, text, or phone call. Is there any services or programs that you know of that can help me achieve this? Hi Brandon – There are a lot on a personal level. Budgeting software like Mint.com provides bill payment alerts. But if you have customers you’ll have to send them email reminders. I’m sure there’s software out there that does that, but I’m not familiar with any in particular. You can use DemandForce to do automated/recurring email reminders. Earn Too Much For a Roth IRA? Nonsense!